wow!! What a story! Good luck to you and I so admire you!!! Wow Sandy! I could change names and cut and paste this to my own blog! It's such a challenging decision to make! And of course then you have the current job market too. Lots of prayers headed up for you my sister. Thanks for sharing your story. I found you through SITS and I'm glad I popped over. It is tough raising a large family with one income. I WAH but my income isn't steady. I have infant triplets plus three others...lots of expenses! Hang in there, prayers for guidance! I would love to stay home with my kids, but I am the "breadwinner" so to speak of the family, and it's just not feasible. My kids are still pretty young, and I think I have a pretty good balance between housework and kid time, although I'll always feel like I never spend enough time with them, even if I were around 24/7. A working parent has to be very good at being able to leave work at work every day and be able to let the laundry pile up every once in a while. Our routine is working well for us all, but what works for one person may not work for the next. What about supplementing income by only working part-time while the kids are in school? Oh Sandy, girl I so feel for you! Big family expenses are tough, and you know as well as I the older they get the more expense there is! My New Year's wish for you is that you are able to find a way to contribute to the finances and be there for the kids after school. It may take some juggling and digging around but I'm sure you can find something out there! Here for ya! What a story! I'm sure you'll make the right choice. It's a hard one. I admire you, I really do. You love your family and you want to help contribute. I feel for you and I will pray that things go better for you in the new year. In August, my Husband said I might have to go back to work. It got really tight for us. We were able to fanagle some money to buy christmas gifts, thank goodness. But I am still kind of looking for a job. I had someone actually tell me that they don't want girls like us with kids at home. As I said before I admire you. You want to go back to work while I am over here whining about going back to work. You're a good wife and mommy. Thank you for your blog. I know that you said it is therapy for you, but it is also so healing to hear about your situation and the thought and prayer that you put into trying to make the best decision for your family. I think this is one of the most difficult decisions for a woman to make, or to make work. I don't know what your qualifications are, but is it possilbe to subsitute teach? or something with hours that are more family friendly and flexible? I would totally do what you feel at peace with after a lot of prayer. I read an article once about a woman who was prompted to return to work even though she didn't personally want to and later on it turned out to be the greatest blessing because she ended up really needing that employment. I know that if it is what God feels is right for you that it will work out. I can also understand your concern. One woman I know of said that she was glad she went back to work because her kids learned to be more independent and helpful around the house. Other women end up feeling guilty because they had a child who grew up to make bad choices and they always wonder if they had not worked would it have turned out differently for that child? I don't know. But I know that if you can receive a firm conviction that what you are doing is right then you will be able to feel good about your choice for the rest of your life, whatever it is. I sincerely wish you the best in this situation. Hugs!!! You know I love ya hun!! I know that something perfect for your situation will present itself. Just keep your eyes open because it might not be what you're expecting!!! I know how you feel about the "guilt" part. Everyone has to find their own way for their own families. You will all get through this!! My heart really does go out to you. The best advice I can give you is to pray a lot about it and follow your HEART! I have to believe that it's the small voice of God telling you what to do. I trust that you will reach the right decision for you and your family. I too struggle with this. I think that many stay at home moms do. I wish that I had an answer but I don't. Just know that you are not alone in your pondering. HUGS. Oy, this is a tough one. In my opinion-when I have/get my babies, I can't imagine going back to work and being away from them for even a little bit. You are so blessed to have your beautiful, healthy children and that you get to spend so much quality time with them. On the other hand, you need to provide for your family, so you gotta do what you gotta do. (((Hugs))) to you in making this extremely hard decision! The choice to have me SAH with our little one was tough. I had been at a job for 4 years, part-time(25hrs/week) that I loved. It was only when our sitter up and left that we realized how expensive daycare was going to be. Honestly, I can't wait until I can go back to work. I have loved being at home with my little one, being able to pick up the older kids from after school, but any little extra $ helps. I know you will make the best decision for you and your family! i go back and forth on this all the time. i have my own company and work from homeand financially its a big help but...sometimes i feel so disconnected from the world...blogging has helped a little...but there are days when i am listening to my hbz talk about something that happened at work, or something that a co worker is going through and i want to have something more to add to the conversation. THEN i look at my darling daughter and think of how amazing she is and how i would just be so sad if i missed a minute of any of her childhood and i talk myself out of going out and joining the workforce....for a few weeks until i have the same argument with myself all over again. you have been so good about always commenting on my blog and i have been sooo bad lately. i appreciate your comments and i hope that 2009 makes a little more time for me to be a better bloggy friend! I feel your pain...it's something I struggle with too. My husband and I know that if it ever got too bad financially, that I would go back to work. We have been on the brink many times. But, I have never, for even a second, regretted staying home with my kids...it has been very rewarding. I will keep you and your family in my prayers! Happy New Year's Eve. So many women struggle with this. We want to have it all-- the perfect wife, the perfect mother, the perfect career. We as women need to learn that it's ok that we can't be everything, as long as we're the very best that we can be! Happy SITS day, my fellow welcomista! What an insightful and meaningful post. Sandy you are an amazing person! Wow! I know exactly what you mean on all fronts! We have 5 kids too, 17, 14, 6,5,3. I am a SAHM and sometimes its really hard! Pray about it and God will tell you - I cannot tell how many times He has covered us!Praying for you and your family Sandy! This is always such a tough decision for parents. I always had to work when my kids were little. I hated every minute of it. Now that they're grown, I sometimes regret that. But you do what you have to do and pray for the best. It all worked out for me and it will for you, too - whichever way you go. Wonderful post, and it's amazing the connections you can make via blog-world. Whatever you do or don't do, don't ever let there be feelings of guilt for not working. As one of five, whose own mother stayed home to care for us (then when my father left, took full responsibilty and worked) I know that there was never a day when it was though "Oh she's not working hard, she's just at home with us!" Being at home with your children IS a job, and one that they'll be thankful for down the road - having you there =] Smile! Thanks for sharing! I know how we struggle finacially with only one income. I have also worked...ya just do what's best for your family. You are obviously a great Mom! I remember this post. You gotta do what you gotta do but stay true to you! You have a beautiful family, but you knew going into this that concessions would have to be made. There were tough choices to be made and it sounds like you and your husband met those challenges. It's hard to sacrafice sometimes and even harder when children are involved. You've got it more together then you realize. Trust your instincts. Oh Sandy, as a working mom I understand this so well. You yourself will battle with this and at the end know what ill be right for you. This is such a tough decision, for those of us who have the luxury of choice. I'm sure whatever decision you make in the end, it will be the right one. Best of luck to you! To work or not is such a tough decision. I go back and forth myself. I hope it works out for you and your family. Can you get out of my head please? Much needed post. Thanks for being REAL. I think you are working through it the best you can. You will make the right decision for your family, but I do think it's good to share. What a heartfelt post. It's obvious that being a stay home mom is very important to you. I give you a ton of credit for realizing that maybe it was something you weren't going to be able to continue. What a difficult decision. I can't help but wonder what happened between the time you wrote this post and now. Are you working? How's it going? I hope you are all happy with whatever direction life and your decision has taken you. Oh, I am going through this inner battle now too, and I know just how you feel. My maternity leave is over in a few weeks and I am just dreading going back to work. Staying at home with my son is very important to me, but unfortunately it just isn't possible now to make it with just my husband's income. It's definitely a difficult decision to make. I love reading a blog where the writer is so focused on her family. Thank you for sharing this post. It is a hard decision to make and I hope you are able to make it without too much lost sleep. I am sure you will make the right decision for your family. Good luck making those tough choices. Great post. As someone who has a large family with one income I understand. Its tight here too...husband works a lot of overtime and never takes sick leave. EVER. I am afraid to have children because I HAVE To work and don't want to neglect them. Thanks for sharing. I completely understand where you are coming from... you are in my thoughts and prayers! This is such a timely post for me, even though you wrote it back in December. I have been offered a job to work whenever I want, however much I want. I should be excited. I should have started working last week. But I know me and I know how I am when I work. The whole family suffers. It took me a long time to become comfortable with staying home. I was a career woman for so long that it became my identity. I'm afraid I'll become that person again. Plus I like being here to see my kids off to school. I like being here when they come home. I like being here with my babies. I. Like. Being. HOME. I don't know what you decided but I hope that you were at piece with your decision. I can certainly understand your dilema. When my boys were young I had to make that decision to. I was lucky enough where I worked that my boss had a woman who watched his kids so when I went back to work it was only for a few hours a few days a week. Enough time to get me out and be with adults, yet I still felt like I had enough time with my boys. My thoughts are with you. It's a very tough decision. You'll make the right choice for you and your family! I think that is one of the hardest choices that a mommy has to make. Not sure if there is ever a right or wrong answer. I am sure you will make the choice that works best for you and your family. I consider myself blessed to be able to stay home and I know it would be awful for me to have to think about working right now. Each mom is different, but I do hope you find peace with this situation. Such a hard balance - work and family. Good luck with everything. I know that's a tough decision to make. As a single mom, I have no choice but to work & when they were younger & always felt guilty working, but we have to do what we have to do. I admit I struggle with the work or not to work issue most days. I do feel guilty that the weight of our financial situation is on my husband's shoulders even though he's fine with it. I think about going back to school...I don't know what will happen. I don't want to become a person who is too busy at work and forgets her family. Sigh. I was always a working woman, but I only had one child and got divorced early in his life, so really there was no option. Such a hard decision too, once you've already committed to being at home with your children. I hope that you found what worked for your family! I love your writing style. I'm sure whatever decision you make will be the best for you and your family. sounds like you got it together. The guilt is sometimes unbearable isn't it?! It truly weighs on my BabyMama too, every single day. And as times get tougher, the guilt grows. You do need to trust that you are making the right decision for all of you. That's where prayer comes in, right? Blessings Friend, hope you find the peace you seek. Don't forget whatever you choose you always love and support your family! Awww..I wish I had some words of advice for you. Thanks for sharing your struggles...I know that you will make the right decision for your family. Oh girl, I feel you. I hope everything has worked out. You know, my kids are really small right now, and they need me at home. I think one day they will need me to be at work so we can give them the gymnastics lessons, camp tuition, family vacations they will want during the rest of their childhoods. I know it will be a hard change for all of us. I am preparing myself now, although I hope it is years away. Good luck to you with your decision. You are amazing! All the best you you and your family. wow. although my hubby and i haven't yet started a family, something that has weighed on me tremendously is whether or not to have a job. i did work part-time at a daycare not too long after we got married, and i must admit, i did not enjoy it. i loved the kids, but the people i worked for were not great people. it made me miserable, and i never felt like doing anything at home. this was hard on my hubby, who was working full-time, then coming home and having to do many of the chores around the farm. i eventually left that job and i still have a hard time figuring out what the right thing to do is. i want to provide for my family, but with our farm, it is hard to have 2 people working full-time. i've settled on substitute teaching right now, since i can pick and choose days i want to work. it's worked so far. good luck and happy SITS day! It's a tough situation no matter what you chose. But only you know what's best for your family and know that's what you will do. That's a tough decision to make, and there is so much to think through. It sounds like you have a very balanced perspective. I hope that you and your husband are able to come to an agreement on what is best for the whole family. Is there a way you could work out of the home? Or a way to cut costs so that staying home would be more financially feasible? Money Saving Mom (www.moneysavingmom.com) has recently been doing a series on 100 ways to save 100 dollars. 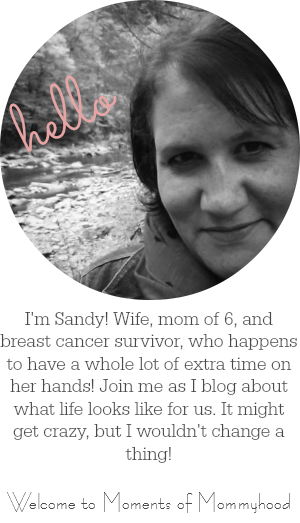 I have learned so much from reading her blog! I'm crying as I read this. I completely understand. COMPLETELY. I stopped teaching 4 years ago after I had my 3rd child. I've LOVED being home. But our oldest will be a senior next year, we STILL haven't sold our other house (2 years now), on and on and on. So it's back to work. And I don't want to. Not because I'm lazy. Becase I will MISS my kids. Still crying. Great post...thanks for sharing! The only advice I have is to follow your heart! I totally agree with you about blogging being therapy. I am so happy I set up my blog. What works for one family..doesn't for another. I'd love to go back to work..eventually..but i fear there may be no work for me. I completely understand how you feel here. I have 5 children as well and I stay at home. God has blesses my husband with a job that pays well enough to meet our needs but there is always the times that we wished there was more income for fun things like more vacations and stuff. But the stuff isn't worth the stress that it would put on me to try to work a job and still take care of my home while someone else is taking care of my kids. So i am just content to be a mommy. The daycare job sounded like it worked out great until your older kids got past the age of being there. so, maybe hold out until your youngest is in school. I know of several of my friends who work at their kids' school, teacher's aid, lunch room supervisor, librarian, secretary, and principal's aid. These hours are usually part time and perfect for getting all of the school holidays off. Just a thought. I will be praying for you. God will take care of you! Blogging is sooo therapy! And you have to know that you are not the only Mommy struggling with this exact issue. Especially now with the economy being the way it is. It sounds like you are doing a great job constantly weighing the needs for your family. Way to go! OH there are so many things I want to comment on, I hope i remember them all. First I see you have 5, so do we. Trying for number six, while you are debating number six. Good luck with that! I too, want to show all sides of our lives and not just the good...even though it can be hard to put it out there. The hardest thing for me to blog about is our rebellious teenage daughter. But I appreciated the support I received. It's hard in this economy to get by. It's hard to watch our husbands work hard. It's hard to feel like we arent contributing. It's hard to leave our kids. I don't know if you are a christian, but the decision should be the Lord's. Don't forget to pray. He'll guide you. I have a friend who is in EXACTLY the same position you are...number of kids and all. Her nursing license was about to expire so she started the process of renewing it. As she began looking for a job, God just started blessing them financially. She saw that God was still in charge even if she thought she needed to work. Not saying that's where you are. Or that you shouldn't work. We HAVE to do what our families need us to do. but don't overlook the obvious. God's plans. I'm getting ready to head back into the work force myself, so this post hit pretty close to home. I can really see where you're coming from, even though my situation was not as difficult as yours. We had a time when only my husband was working in order to pay for our expenses and my international student fees, which were killing us, but was the only way for us to stay together. He had to work out of town Mon - Fri and it was really tough seeing him only for the weekend. But we managed, we moved back to my country, and while he was in my shoes for a few months while we were settling in, he is now working from home. Maybe such an option would allow you to both spend time with your family and also make income? I believe it's worth looking into! I am so glad in the end, you made the best decision for you all! What a hard situation. It's one that most of us sahms will eventually have to consider. I had a point when I was almost certainly going to have to go back to work. It broke my heart to think about having to be away from my son so much. In the end, I got to stay home, but I know now that if I had gone back to work, it would have been ok. Different, and not what I had in mind maybe, but ok. Kids are flexible. They'll adjust. They'll miss you, but they'll be ok. It's us grownups that have to battle with expectations, and guilt, and all that stuff. A mommy is a mommy. Whether you have an outside job or not, your heart is always with your kids. That sounds difficult! I'm not a working person myself so I'm super lucky that my husband is willing to let me be a SAHM. He believes that it is saving us a LOT of money in child care and then our kids have our values instilled in them. I know this is true so it makes staying home a lot easier. I still feel bad that I'm not contributing to the amount of income we recieve. I love to crochet and am thinking about selling some of the stuff I make. It would feed my passion and help provide even if it is only for a $5 pair of shoes for our kids it would help. Maybe you could find some type of thing to do at home and make a profit off of it. Etsy.com is full of inspiration. You are such a good woman. My hubby wishes I would feel guilty for his providing for us for the last 15 years.... but I don't. I have run my own Pampered Chef business for 9 years now... maybe you could do something like that. OK, you made me cry. Probably made me feel sorry for myself too. I really miss my job. I make 1/5 what I used to. I never get to talk to adults. And, I'll never be able to go back, because in my industry, once you leave you are forgotten (not to mention technology runs away from you!) I don't know how you do it with 5 kids, I can barely keep up with two...and I feel like I spent everything I had in me on the first one and am shortchanging the second one. Is this ever gonna get easier, or feel more rewarding? Where's my ROI? But, thank you for reminding me I am not alone. That helps. Really it does. I can so relate to this post. I too have been a stay at home Mom, a part-time working Mom, back and forth. I just went back into the work force and I'm really loving it! What ever you decide (or have decided) to do will be what's right for your family! And it sounds to me like your husband understands that you've been working just as hard as he has all these years, even though you weren't bringing home paychecks! That's what team work and being a family is all about! It's tough to know the right thing to do. Isn't it? Because what works for one family may not necessarily work for another. Every family has to find it's own rhythm and sometimes it's a process you go through more than once. We too are on one income so I feel your pain. Good luck in making the right decision! blogging is definitely therapy, i know that to be true. Thank you for the insight into your life. I have struggled with working full time and taking care of house and kids lately. Good luck with whatever you decide to do! I've had the same feelings of guilt... I've been a SAHM for almost 3 years now. When we made the decision, I was working full-time and like you, I felt stressed, work was taking me away from my family... and we realized I was basically working just to pay for childcare. I know I'll have to go back to work in a few years, but until then, sometimes it is hard to have only one income. Thanks for this post, it was a very insightful read. Blogging is therapy. Hope everything works out for the best. happy SITS day. Sandy, I understand your post so much. My family and I are at rock bottom but the one thing that remains is our love and strength through one another. I will say a prayer. I hope since December things have gotten better for you and your family. Happy SITS day. I know how you feel. My husband works very hard, and sometimes I feel guilty I can't/don't contribute financially. I've tried finding part time work, but the job market is horrible. Guess we've got to keep on keeping on! I can relate a bit. It is a hard choice to make, but worth it! Love your blog! That's a hard choice to make, that's for sure. Good luck figuring things out. It's so hard to make those sacrifices for our kids, yet other things can suffer financially too at times. Hope things work out the way you'd like. Things will always work out the way they're supposed to. Best wishes with the decision-making! Though I don't have to make that decision (yet), I know it's got to be a hard one! I totally understand where you are coming from! I've had this same battle going on for years...do I work or don't I? If I do how many hours? I feel guilty that my husband works more than I do.....but then guilty if I'm not there for the kids! Hope things have worked out for you since you posted this! Hope things are working out for you all. I know what it's like to struggle on one income and to also work part-time and balancing that with family life. Just know that these struggles of yours are good life lessons for your children. They will be learning tons from you two on how to handle life's challenges. It may not always be well done (we're not all perfect) but you keep picking up and trying again. Some of those are the best lessons of all. Good for you! Oh wow, what a journey! You really are quite the trooper! I'm praying for you and your family! It's a hard decision! Kids are resilient, so if you feel you need to work, they'll be OK. Find something in the schools so you have holidays, snow days, summer, etc., off with them. I have worked the whole time I have been a "grown" up (except for 9 months!) It's so hard to work outside the home but I had to do what I had to do. Sometimes we do things for the betterment of our families and to help anyway we can. I wish you well and hope you find an amazing job that you will love so you won't miss the job you really love! Wow. I can definitely relate. I left my job for the same reasons and wouldn't have it any other way. I agonized over the decision to stay home with my daughter, and even though there have been some rough days and money is definitely tighter, I don't regret it for a minute. Stopping by from SITS...and I think this post will resonate with a lot of SAHMS - myself included. When my husband and I both worked full-time, it was really hard on all of us - running running running all weekend long and barking at the kids all week because no one was ever moving fast enough to get everything accomplished. That played into my decision to stay home as much as the finances did. Sandy, we are a family with 3 children and one income and I too am constantly entertaining the thought of returning to work. My twin girls will be going to college in 2 years and the cost of that, and the addition of 2 drivers + insurance this summer is quite daunting. I wish you peace in your choices. This was such an excellent post. I am totally curious how things ended up for you and your family. I hope whatever decision you made is working well for everyone! Blogging is total therapy..sometimes I blog without ever posting it. It just feels better to put it on screen. It's the modern day Diary...thanks for sharing. It is a hard decision. I was a stay at home Mom and I know we did without because of it. When my kids were in HS I started working again... and ended up coming home again because I had one child that was quite a challenge and needed a little more supervision. But I think it was good for my kids. As one of your commenter's said... we do what we have to do when we have to do it! Again, congrats on being the FB! Good luck with your decision.... Im sure you will do what is best for you and your family! i dont think i can truly say that i understand how it feels for you as i don't have kids yet. i admire working moms who try their best to give their kids quality time even when they must be exhausted from work. But then i also admire moms who choose to stay at home and personally take care of their kids especially if they have the freedom (financially) to do so.And now with five kids, i'm sure it was the best decision you made for your family. And i know that even being a Stay at home Mom is not easy. I remember this post and I remember thinking What a great lady. She wants to go back to work to help out and here I am upset because in a couple of years I will have to go back to work and I don't want to. I totally know how you feel. I decided to coach track this season thinking it would be only 2.5 hours a day.... It's been way more than that. The oldest now asks me not to go to track. The boys want me to say home. I feel torn now. for me it's almost done but this won't be something I do again until the boys are older. I'm a mom first and everything to everyone else second. You made teh right choice. It's such a hard decision. I am in the situation now of most likely having to go back to work full time. I'm going to try to get a job where I can work nights. It's going to be tough - less time with husband, but that way my son won't have to be in daycare. On one hand, the idea of not being with my son 24/7 sounds like a little bit of a relief. On the other hand... someone else? Taking care of my kid? ARGH! Wishing you all the best through tough times and tough decisions. Good luck! I hope you find the mythical perfect mom job! Oh, I feel for you... I have the same struggle, although I am currntly working part time and debating whether to stay home for so many of the same reasons you list. Unfortunately, nothing is perfect. I hope you have found the perfect answer for yourself!